HHT is a hereditary disorder (meaning it is passed down through generations) that is characterized by abnormal blood vessel formation. A person with HHT has a tendency to form blood vessels that lack normal capillaries between an artery and vein. This means that in a person with HHT, arterial blood under high pressure flows directly into a low pressure vein without first having to squeeze through the many very small capillaries. This place where an artery is connected directly to a vein tends to be a fragile site that can rupture and bleed. 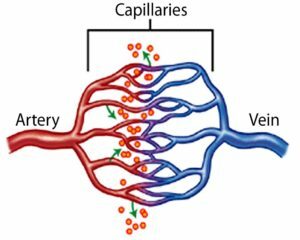 Additionally, since the capillaries did not form correctly, they are not able to deliver oxygen to tissues as effectively. HHT is caused by a change (called a mutation) in one of several HHT-associated genes. Having a mutation in an HHT gene causes blood vessels to form improperly, leading to the symptoms of HHT. Mutations in ENG and ALK-1 account for 80% of all cases of HHT. In each HHT-associated gene, there are hundreds of mutations that can cause HHT. There are at least two other genes that have not yet been identified that also appear to cause HHT symptoms in a smaller number of individuals. A mutation in the ENG gene causes HHT1. Lung and brain AVMs are more common in patients with HHT1 than HHT2. A mutation in ALK1 causes HHT2. Liver AVMs are more common in people with HHT2. 3-5% of cases of HHT are caused by a mutation in SMAD4. A mutation in SMAD4 causes a combined syndrome of juvenile polyps of the GI tract and HHT, also known as JP-HHT. Above: One possible configuration of a family of five, where one parent has HHT. For each of the three children, there was a 50% chance of inheriting the HHT gene mutation. In this case, only one of the three children inherited HHT. Gender does not affect whether someone will inherit the disease. HHT is an autosomal dominant genetic disorder. This means that if a parent has HHT, no matter their gender, each of their children will have a 50% chance of having HHT. Every person has two copies of each gene, one copy from their mother and one from their father. A person with HHT has one mutated copy of an HHT-associated gene and one normal copy, the mutated copy causing their HHT. When a person with HHT has a child, he or she will either pass on the normal copy of the gene or the copy with the HHT-causing mutation. A child who inherits the HHT gene with the mutation will have HHT, while if a child inherits the normal copy of the HHT gene they will not have HHT. Therefore, each time an HHT affected person has a child, there is a 50% chance that the child will have HHT. Nearly everyone with HHT will have inherited the disorder from a parent who also has HHT. In very rare cases, a change in an HHT gene occurs in the egg or sperm cell of someone who does not have HHT themselves. In these cases, the resulting child will have HHT, even though the parents do not. It affects males and females of all ages and ethnic groups. Is there a test for HHT? A person can be diagnosed with HHT through either a clinical examination, genetic testing, or both! Yes! Although there is not yet a way to prevent telangiectasia or AVMs from forming, most can be treated once they occur. They should be treated if they are causing a significant problem (as in the case of frequent nosebleeds) or if they have a high risk of causing a problem (such as a stroke from a Pulmonary AVM or Brain AVM). The current recommended treatment for telangiectasia or AVM depends on both the size and location in the body.